Mental Imagery Brain-Computer Interfaces (MI-BCI) represent a mean to control new technologies by performing mental imagery tasks alone. Throughout the research and development process of MI-BCI, human supervision (e.g., experimenter or caregiver) plays a central role. While providing emotional and social feedback, people need to present the technology to users and ensure the smooth progress of the BCI learning and use. Though, very little is known about the influence people might have on their results. Such influence is to be expected as social and emotional feedback were shown to influence MI-BCI performances and user experience. Furthermore, literature from different fields indicate an effect of experimenters, and specifically their gender, on experiment outcome. 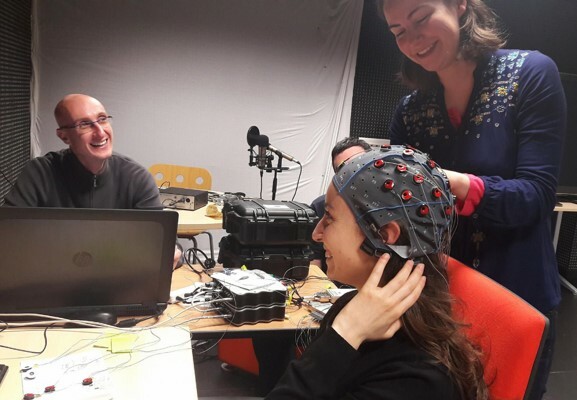 Therefore, we assessed the impact of experimenter and subject gender on MI-BCI performances, progress and user experience. Our results suggest that overall female experimenters influence positively participants' performances compared to male experimenters. Roc, A., Pillette, L., & Lotte, F. (2018) « Toward understanding the influence of the experimenter on BCI performance », Journée Jeunes Chercheurs en Interfaces Cerveau Ordinateur et Neurofeedback.